Took the Legerra to Mick Gardner Racing today for a suspension set-up, what a really nice chap. Basically all we did was drop the car off with the instructions that we wanted to use it for fast road, we thought it was too firm and felt it lacked confidence on the road. He seemed really impressed by the weight balance of the car, and said it takes a lot of work to get a Porsche GT3 as well balanced. 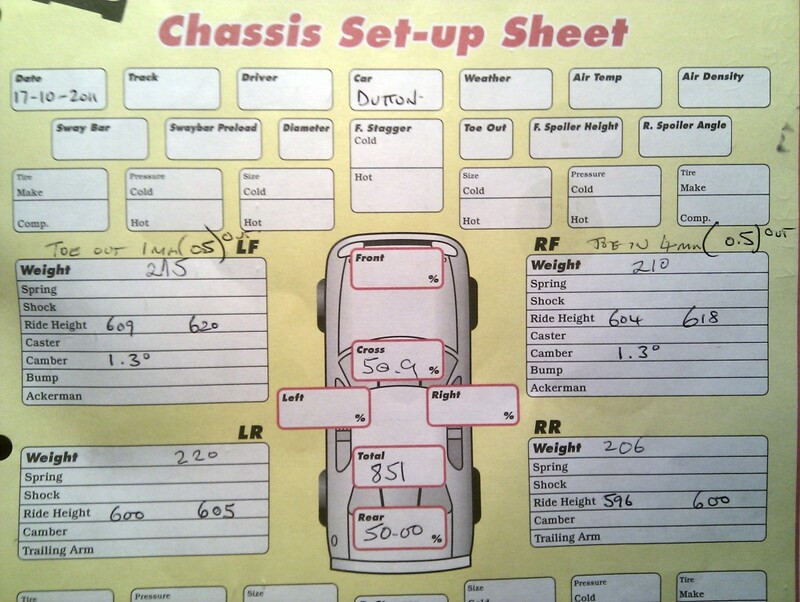 As shown on the setup sheet, there’s almost exactly 50/50 (not sure why the percentages add up to more than 100%) front/rear weight balance and only 5kg difference left/right at the front, and 14 at the back.The 851kg total is with full LPG tank and two thirds full petrol, which I guess isn’t bad. Apparently the set up was quite bad before as there was 1mm toe out at the front left and 4mm toe in on the front right! Took the car out for a short spin straight after, and though I didn’t get a chance to really push it, it was immediately apparent how much better the car handles. Comfort is massively improved and turn in feels much more confident. Thats interesting as mine only clocks 635KG with the roof off, windows off, but a full tank of 30L (ish), that LPG tank must weigh a fair bit. Mine did have roof and windows but still that’s quite a difference… Is it a pinto engine?